The Digital Humanities Initiative and the Libraries’ DH Working Group welcome students, faculty and staff to work collaboratively in the DH Lab (Alexander Library, Room 406-407). 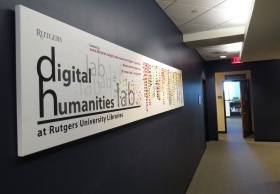 This space is available to members of the Rutgers DH community for use in project work, consultations, research group meetings, small classes, and lectures. See available times as well as open lab hours on the Calendar. Use the DH Lab Reservation Form to request the space. Access the lab using your Rutgers ID card at the card reader. For more information on how to use the lab, please consult the libraries’ DH Lab Procedures. If you’re a self-starter, consult our DH Lab Guide for a curated list of online tutorials on various applications and digital methods. 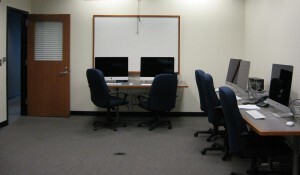 The DH Lab is equipped with five iMac workstations, flat screens for presentations and group work, a network attached storage (NAS) device, Internet connection, floor outlets for plugging in, and the following software installed on the workstations. In addition, the Libraries support installations of WordPress and Omeka for web publishing projects in digital humanities research and teaching. See WordPress and Omeka Procedures to learn how to request a site.